It’s only been over the last couple of years that I’ve really started to love Halloween. I never really had much interest for it growing up, and you definitely would have never caught me watching a scary film. These days my tastes have changed somewhat, and I now fully embrace all things Halloween and spooky. For Halloween this year me and Chris are throwing a Halloween party like we did last year, and I love a good excuse to get dressed up in a costume and prance about. I say party, but it’s about 5 people as that’s all I can fit in my small flat, so after a few drinks we’ll probably crack out a few spooky films in the spirit of Halloween! 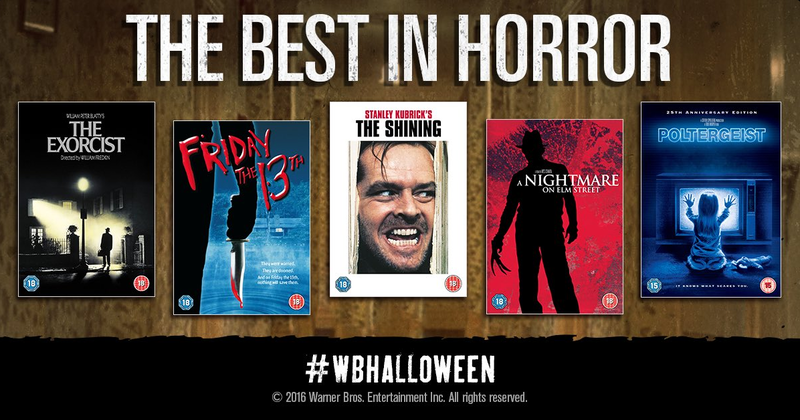 Whatever your plans are this Halloween, here’s some top horror films for you to watch! The Exorcist is a classic supernatural film, where a 12 year old girl is possessed by an evil spirt. Two priests, played by Jason Miller and Max von Sydow, then risk their sanity to administer the rites of demonic exorcism, while the girls mother watches horrified as her daughters body is wracked by satanic disfiguration. This is probably one of my favourite horror films. Set at a recently re-opened summer camp, a group of teenagers take jobs completely unaware of the circumstances that had led to its closure. It turns out a young boy named Jason was drowned, as well as the murder of two counsellors, over twenty years previous. Once the camp reopens the killing begins again, with the teens being murdered one by one. Struggling novelist Jack Torrance decides to take a job as an off-season caretaker at the Overlook Hotel, completely ignoring the warnings that the isolation over the winter drove the previous caretaker mad. Jack moves in with his family, and it turns out his son Danny has a special gift that can sense evil present in the hotel, which develops more as the winter snow shuts them off from civilisation. A teenage girl, Nancy, consistantly suffers from nightmares and discovers that many of her friends are also having similar sleeping problems. It turns out their dreams are haunted by the hideously scarred former child murder, Freddy Krueger, who has the power to kill them in their sleep. Sadly Nancy knows she can’t stay awake forever. This isn’t one of my ultimate favourites, but it’s definetely still a good classic Halloween film! A family of forces invades a peaceful suburban home, transforming the house into a supernatural sideshow. However the forces are far from friendly. Will you be watching any of these this weekend?